It had been exactly ten days, ten hours and ten minutes since he’d last fed. The hunger was maddening. She’d locked him in this godforsaken basement and even the rats had the good sense not to hang out down here. It felt more than a bit like a scene from Psycho, the only thing missing was a mummified ‘mother.’ Truth be told, even a mute mummy might be good company at this point. 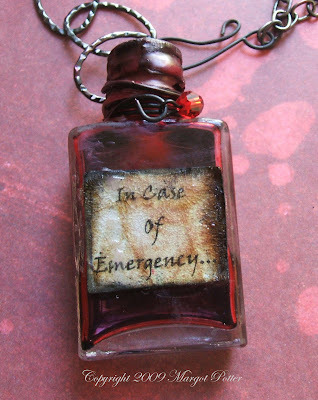 He had worn this amulet for years, just in case. The blood was so old, cold and stale it would taste vile, but desperate times and all that jazz. 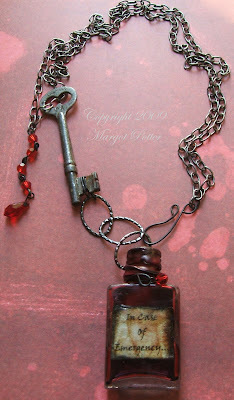 The skeleton key was sturdy and could easily break the wax seal on the tiny flask. It was only a momentary solution to a monumental problem...but he would find a way out. There was no way in hell he was going to spend eternity like this, and when he got out, she'd be his first victim. This little bottle that my daughter found in our backyard has been begging me to put it into a design for a while now. I think I've mentioned it here at least twice! Finally, yesterday, at the end of my work day, I got this project completed. Just in time for Halloween! I have to say, these macabre designs are becoming a guilty pleasure of mine. Printed paper centered In Case Of Emergency in Viner Hand ITC 10pt. 1. Create a centered document with the words “In Case Of Emergency” in Viner Hand ITC 10pt. or a font of your choice. It needs to fit your jar. 2. Print document and cut label to fit jar. Crinkle paper and gently dab vintage photo on paper using a foam applicator. This gives an aged effect. Edge the paper with black soot and foam applicator. Work from outside in gently moving applicator in a circular motion, be judicious! 3. Apply label to jar using BeadFix Squares. Glue sets fully in 24 hours, but works on contact. 4. Apply a thin layer of Rock Candy Distress Crackle paint and allow to dry. 5. Squeeze alcohol ink into jar. 6. Cut a 3” segment of wire using memory wire cutters. Wrap jar with wire several times, making a small loop on the front and a larger loop at the back that will serve as your bail. Tighten wire with pliers. 7. Seal cap and wire with wax. You can melt the wax in a melting pot and apply it with a small brush or you can use your stylus to melt it and apply. Wax gets VERY hot...so be careful! Allow wax to dry. 8. Use foam applicator and alcohol ink to stain wax red. Allow to dry. 9. Attach the three link chain to the bail on the back of your jar. 10. Wrap a small section of wire around the bottom of your key, making a small loop. Attach the small loop to the open end of your three link section of chain. 11. Create a rosary style chain with four of your crystal rounds, ending with a tear drop. The head pin threads through one side of the teardrop and you bend it flush to the top of the pendant and create a small loop at the top. 12. Attach your fifth crystal round on a head pin with a looped top to the loop at the front of your jar. 13. Slide the chain into the top of your skeleton key, folding it in half. 14. Create a simple hook clasp attaching it to the two open ends of chain. I'd come up with an emergency to wear that, dahling! That is so deliciously spooky Margot! I love it! I love the way you made that bottle so integral to the story... and the mixed media way you grunged it up. I will come back to learn more of your techniques here becuase I have a related project that I have been itching to make! Amazing. This is more art than craft. Gruesome and gorgeous! Thanks for a super fun tutorial! Thanks for the kind words everyone! I really had fun dreaming this project up and I'm so glad you liked it! What a great vintage look. I love what you did with the bottle itself. What an amazing project. Thanks for sharing it! That is SOOO creative, I love this! What a fun conversation piece. I'll be linking. LOVE IT!!!! What a fabulous find and how nice of Avalon to share it with you. I'm sure she'll have fun wearing it too! Good job, fabulously creative and fun. Great project (and spooky story). 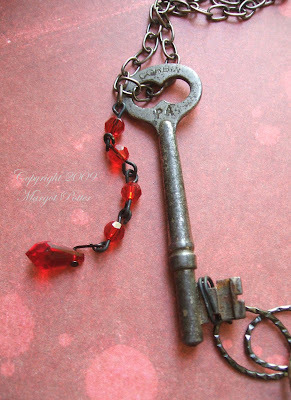 The skeleton key is awesome,I have one like it! Now this is creepy-cool :) Love it. Thanks for sharing! So wicked - I love it! Great atmosphere, too. You'd need just the right kind of black garment to wear with it - not just any kind would do. Wow! I really adore this necklace. Excellent! !